Indiana's transfer on death deeds are a useful way to convey ownership rights to property without the need for probate. The rules for claiming the property are defined in IC 32-17-14-26(b)(20). Primarily, the statute explains that the beneficiary must complete a transfer on death beneficiary affidavit containing specific details of the deed, present that affidavit to the local auditor to verify any transfer taxes, and then submit it to the county recorder who will enter it, and therefore the finalized conveyance, into the public record. 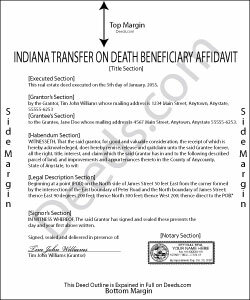 Beneficiaries listed on Indiana transfer on death deeds may use this form, which meets the statutory requirements, to claim ownership of the real property described in the deed.